I became a vegetarian when I was 17, 28 whole years ago. Way back then when the dinosaurs were still around the only thing you could find when out to eat was a side salad (iceberg lettuce, 2 cherry tomatoes, croutons, please hold the bacon bits. Um, I said hold the bacon bits…). Fast food joints equaled Taco Bell bean burritos or french fries. They did not do salad. Back then when I went to McDonald’s and asked for a burger no burger extra veggies 90% of the time I got a blank stare or outright not being nice laughter. Mostly at McDonald’s, still don’t go there anymore. Probably why I still curse too much to this day. Fast forward to today and I can eat pretty much anywhere besides Cracker Barrel (bacon in the green beans!) or Apple Bees. But as a person who hasn’t ate (eaten? I can’t decide) meat in so long that if I do on accident it’s the equivalent of food poisoning, I sometimes have to ask if there is some kind of meat broth or lard (I love Mexican food) in things and I hate to do it because I don’t want to be a pain. So you cannot even imagine how excited I was that there were enough vegan restaurants in Asheville to eat at a different one every night of the week. Not even just vegetarian, vegan! By far one of the best dining out experiences I have had was at Plant. 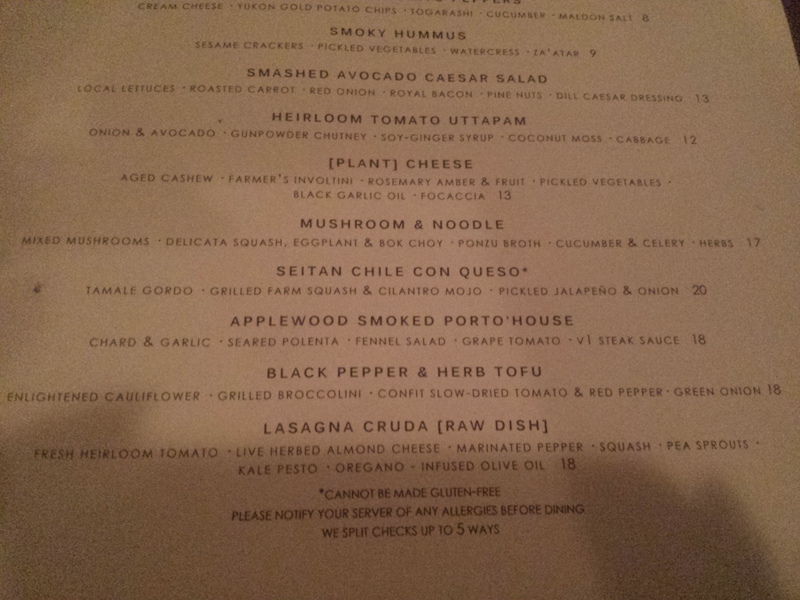 I decided since I was living large and all that I would go all in and try the raw Lasagna Cruda. I haven’t really tried raw meals before, but all the more reason to try it when someone else is not cooking, right? I only tried it because it was in my I’m-on-vacation-screw-it-I’ll-try-anything mood, but it was one of he most amazing restaurant meals I can even remember. Live herbed almond cheese and kale & pecan pesto almost kept me from trying this, but they ended up being the best part. My definition of restaurant food worth the drive / money is something that would take me all day to make myself (and still wouldn’t taste as good) and this definitely fit the bill. Bad picture but it was the kind of place where taking pictures at all seemed kind of over the top. Just trust me. My partner in crime had the Seitan Chile Co Queso and that was pretty dang amazing too. We actually started the whole thing off with fried plantains drizzled in some undefinable not too hot hot sauce that made me want to eat there every day. The second night we went to the Laughing Seed Cafe. This was the night after hiking over 8 hours, and in all honesty I think I was leaning against the wall eating half asleep. I took no pictures, ate part of the East West Quesadilla, and basically zombied through what was probably a great meal. All I really remember was they had an amazing bar drink with ginger in it and my partner in crime had a dinner with tofu (neither of our favorites) that was absolutely amazing. Low Country Rollups which was a BBQ sauced wrap that has inspired me to try making something somewhat similar. We shall see. I don’t know of any restaurants near me like these. There is The Cider Press Cafe out in St. Pete, but it’s fairly far from me so I haven’t tried it yet. Probably eventually. Do you have any great vegan or vegetarian / vegan restaurants near you? If so where are you, I want to go! How wonderful! Many moons ago, I was once a vegetarian and I distinctly remember the “food poisoning” you mention. Even now, although I’m not a vegetarian or vegan, I still can experience bad reactions to food when a restaurant uses an ingredient I don’t normally eat in my diet, like lard. Yuck. Glad you found a place you enjoyed while on vacation! Asheville is very hip like that. Now, we just need more restaurants like that here! I’ve been looking and there are a few vegetarian / vegan restaurants around Tampa. They’re few and far between though. I’m going to have to make it my mission to go try a few.